This little finger puppet was a surprise gift for a five year old friend of mine. It was a “just because” present made from leftover scraps of felt, and even with the postage it was a nearly-free gift. Hearing she had mail was a thrill, then to see her new little toy — that would have been enough of a treat! 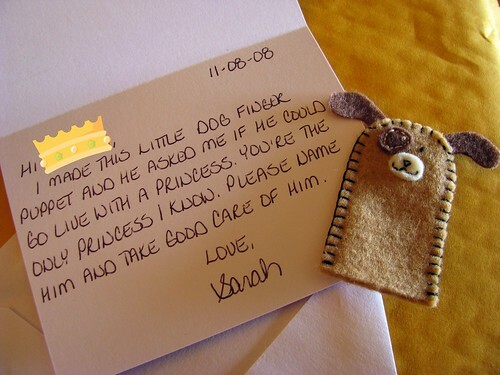 But her favorite part was when her Mom read to her that the little dog had asked to go live with a Princess. Realizing I meant her made her absolutely glow. The real gift here was the unexpected compliment. Who doesn’t love those? A tiny felt legend was born. (And yes, I did happen to have my camera in my hand to capture this momentous occasion.) Now as Hal travels around the country on business, DracuPig tags along and meets some of the most interesting people in social media and beyond. 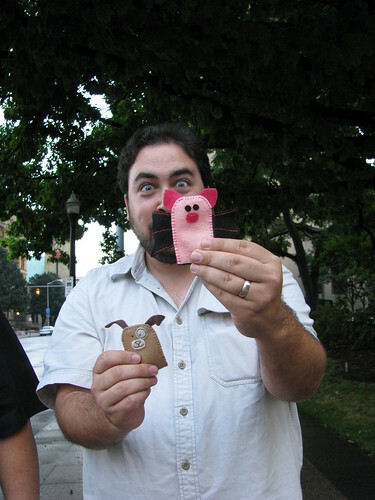 The magic is all Hal, but the finger puppets are a nice foot in the door. Go ahead and Google DracuPig. He’s kind of a big deal. For a finger puppet. The lesson I’m trying to pass along here? Don’t talk yourself out of giving a gift because it’s just a small thing and you think it won’t be worthy. Even the very smallest kindness can go a long, long way. Sarah, your friendship is the real gift. You bring a light and a happiness to everyone you touch, and I’m honored to know you. Dracu-Pig says hi and he misses you.